Senior Sydnee Kerekffy choreographs a new song for the Dance Company. The company will be performing during halftime at basketball games and they have a show scheduled for the spring trimester. The audience waits in anticipation as the dancers hold their place, steadily, like statues decorating the stage. The soft music starts, the lights go up, and their bodies begin to move with elegant motion and precise steps. The dancers have perfected their subtle movements, making sure their synchronization is perfect through hours of practice. These are the intense emotions that rush any one of the dancers when they’re faced by the audience. 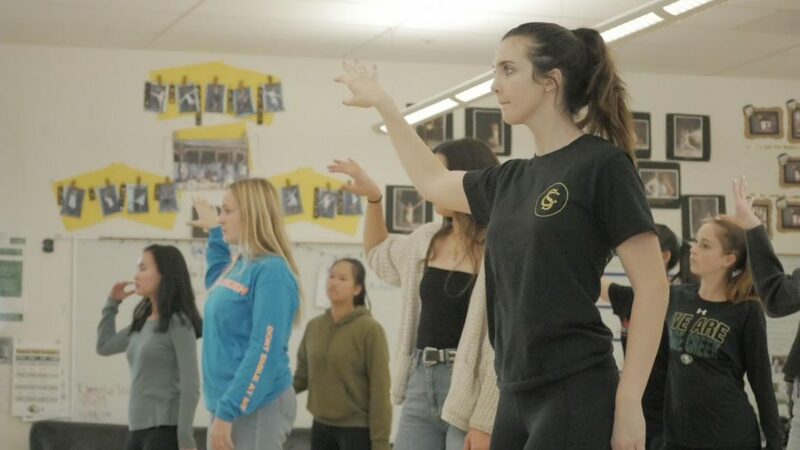 Sage Creek’s Dance Company has started its year off strong, with a performance, “Awaken,” in the new PAC, which wowed audiences with brand new choreography and a special boys routine. “I think the [most fun] was the boys dance because our whole friend group got to be in it together, and the crowd really had fun with the show,” Senior and team captain Sydnee Kerekffy stated. The girls have become less of a team, and more of a family, with the help of bonding activities improving the team’s morale and spirit. Dance teacher Katie Chrisman is the person who bonds the team and makes them like a family. “[She] fosters a really positive environment for us to learn and grow from each other. She preaches inclusion a lot, so we’re really inclusive here, with letting everyone have their chance,” Junior Sierra Blechschimdt explaining how Chrisman allows everyone to have a chance to get on the dance team. The improvement of representation around campus and at school events has allowed the team to grow and prosper, inviting new people into the program. “[As] we’re getting… out in the community [more] so we’ve got a little more of a presence now. 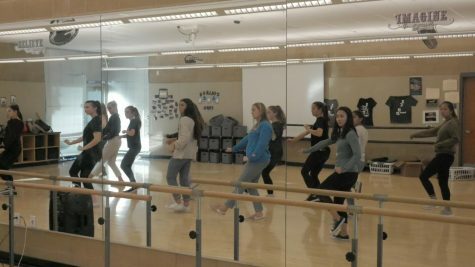 I think people recognize that Sage Creek has a dance team and that it’s something people want to be a part of in the future, that’s why we’ve got so many newcomers this year,” Kerekffy said. The Dance Company dances to the song “Lick” by Cardi B. The Company spends an hour after school perfecting their moves, making sure they’re prepared for their next show. Sage Creek Dance Company is expanding at an alarming rate, going from 14 dancers last year, to 19 this year, even after losing some seniors. After all, the team is really excited for what they have planned for the rest of the year, including basketball halftime shows every Friday at home games, a spring show yet to be revealed and a performance at the Festival Of the Arts. This tight-knit family has a year of exciting routines to learn, dance moves to perform and audiences to wow. After all, Chrisman believes the audience is at the root of why they perform.